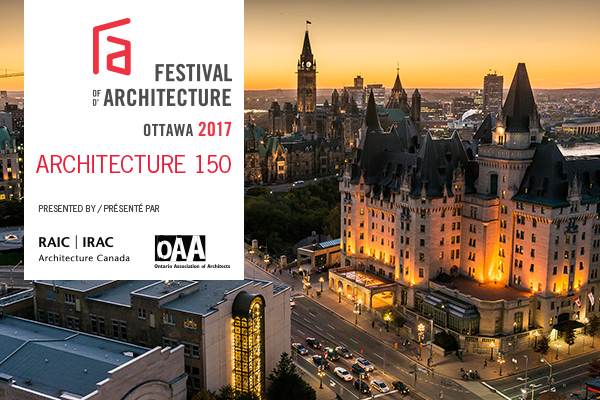 OTTAWA, November 23, 2016 – The 2017 Festival of Architecture will be the architecture event of the year, packed with an exciting array of tours, seminars, speakers and more, all happening in Ottawa during Canada’s 150th birthday celebration. The Royal Architectural Institute of Canada (RAIC) and the Ontario Association of Architects (OAA) have partnered to present the Festival under the theme of Architecture 150. It takes place May 24-27, 2017 at the Westin Hotel, steps from Parliament Hill, the Byward Market and the Rideau Canal, a UNESCO World Heritage Site. The four-day event includes dozens of continuing education sessions, plus tours, keynote speakers, an awards gala, social events and fun networking opportunities. Adding to the sense of this historic occasion, the RAIC will mark the 110th anniversary of its founding as Canada’s national architecture association. Explore the national capital region’s many attractions including award-winning restaurants, historic sites, national museums and must-see architecture by Moshe Safdie, Arthur Erickson, and Ernest Cormier. The OAA Admission Course will be held during the Festival, a mandatory requirement for licensure for all Interns in Ontario. The RAIC and the OAA will announce keynote speakers, special guests, and more events in the coming months. Save the date and book early as hotels are filling up quickly for this exciting time in Ottawa. The Ontario Association of Architects is a self-regulating organization governed by the Architects Act, a statute of the Government of Ontario. It is dedicated to increasing the knowledge, skill and proficiency of its more 5,200 members, and administering the Act to serve and protect the public interest.